[Later] on 4th & D, 1962. May 1962. [stamp]: Lake Oswego Studio, 216 N. State St., NE 6-1028. Lake Oswego, Oregon. Description Pinholes. 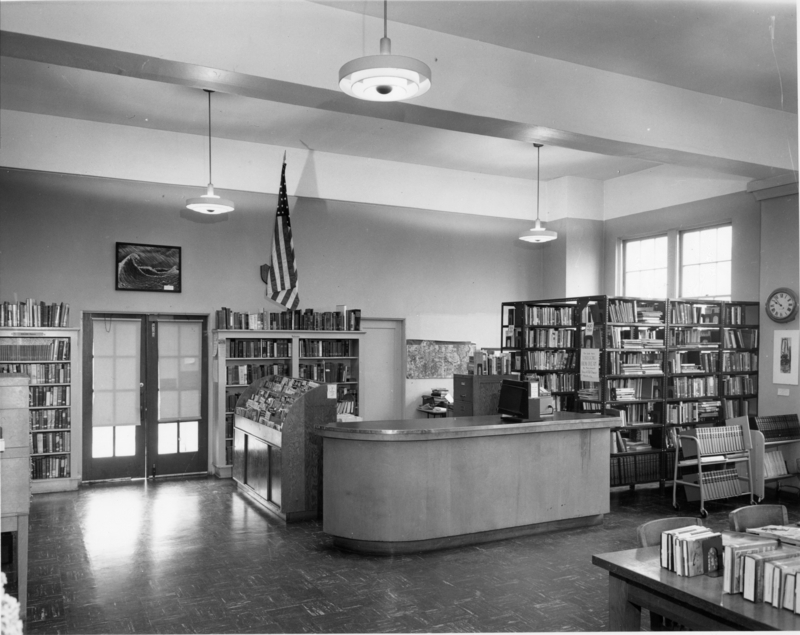 Display caption: In 1951 stationary chairs were replaced with folding chairs and the Oswego Pharmacy donated a magazine rack. Sign display: For sale here "Oregon Iron Dream" by Mary Goodall, Story of old Oswego. $3.00 a co. Transcription [Later] on 4th & D, 1962. May 1962. [stamp]: Lake Oswego Studio, 216 N. State St., NE 6-1028. Lake Oswego, Oregon.